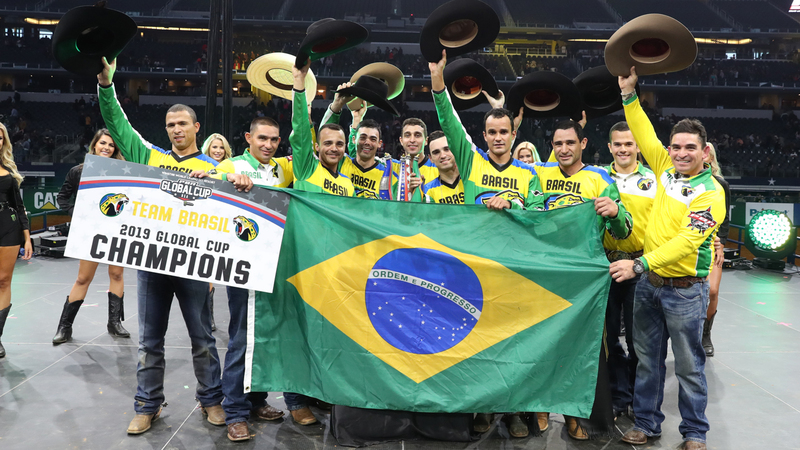 ARLINGTON, Texas – For the second consecutive edition of the PBR (Professional Bull Riders) Global Cup, Team Brazil was crowned the top bull riding nation in the world, winning the 2019 WinStar World Casino and Resort PBR Global Cup USA, presented by Monster Energy. Other top performers for the nation were: Cody Teel (Kountze, Texas) who went 2-for-3, adding an 87-point trip aboard Gambini (Dakota Rodeo/Julie Rosen/Clay Struve/Chad Berger) in Round 2; and Brennon Eldred (Sulphur, Oklahoma) who delivered a flawless 2-for-2 performance, including an 81-point ride on Tri-County Ford’s Coyote (Wallgren & Hale Bull Co./Harrill/Angell/Burns/Wheeler). Led by Lachlan Richardson (Gresford, New South Wales), Team Australia finished fourth. In sixth was Team Canada going 3-for-18, good for 258 points, to net $39,500.